Have you recently been diagnosed with a health condition related to asbestos exposure such as mesothelioma, asbestosis and lung cancer? You need some information to determine where you were when you first exposed. Asbestos is essentially a mineral consisting of oxygen, silicon, hydrogen and other metal ions. Asbestos fibers have strong insulation qualities: The fibers are strong, flexible, and do not burn. The three most common varieties of asbestos fibers are amosite, chrysolite, and crocidolite. Since asbestos consists of very tiny fibers, smaller than the diameter of a strand of hair, it needs to be combined with other materials. Those combined materials are commonly called asbestos containing material or ACM. There are numerous industrial products made with asbestos including ceiling panels, wall / pipe insulation, sealants, and cement pipe. ACMs were in common use by the automotive industry, shipping industry and NASA for insulating the Space Shuttle. However, the major problem of ACMs is the dust which originates from asbestos manufacturing, installation, and ultimate deterioration that releases asbestos in the air. Asbestos is such a small, powdery material, that it easily becomes an airborne toxin that people inhale. 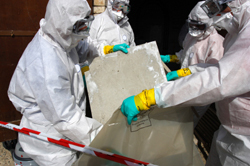 Once inhaled, asbestos produces serious health problems. Congress placed a moratorium on the production of most asbestos products in the early 1970s. Manufacturers, however, continued to install asbestos products through as late as the early 1980s. According to the U.S. Department of Health and Human Services, between 1940 and 1980, an estimated 27 million American workers had occupational exposures to asbestos that could adversely affect their health. While asbestos is no longer in use and has been banned by current legislation, there are still asbestos-containing products which have continued to be sold. As a result, the dangers of exposure are still as strong as ever. There are individuals throughout the nation who were needlessly and avoidably exposed to asbestos including ship fitters, pipe fitters, demolition workers, and railroad / construction workers. Baseluos Law Firm represents people affected by mesothelioma. Those individuals diagnosed with mesothelioma or lung cancer caused by asbestos exposure may very well have financial recovery due to them from companies responsible for their asbestos exposure. Contact us online for a free consultation to discuss your legal options. Best time to call? Enter text from the image above. Please enter the text from the image on the left.